First and foremost, before I get on with this week’s post: Thank you, thank you, thank you for your prayers, encouragement, kind words, advice, and all around awesomeness. I definitely needed that last week and you delivered. Special thanks to Muffin, who is without doubt the best sister that ever there was. I hate dieting. Did you know that? What’s more, I’m bad at it! I know what’s good for me and the basic principle (eat more veggies and less crap) but I also like to be rewarded for my efforts. So if I had a particularly nutritious lunch then I certainly deserve an afternoon snack that consists of lots of sugar and chocolate and stuff that’s pretty much bad for me (and before you make the “but dark chocolate is good for you!” argument, I should stress that I’m not a huge fan of dark chocolate, I’ll suffer through it, but if I’m on a sweets binge, it’s milk chocolate all the way). 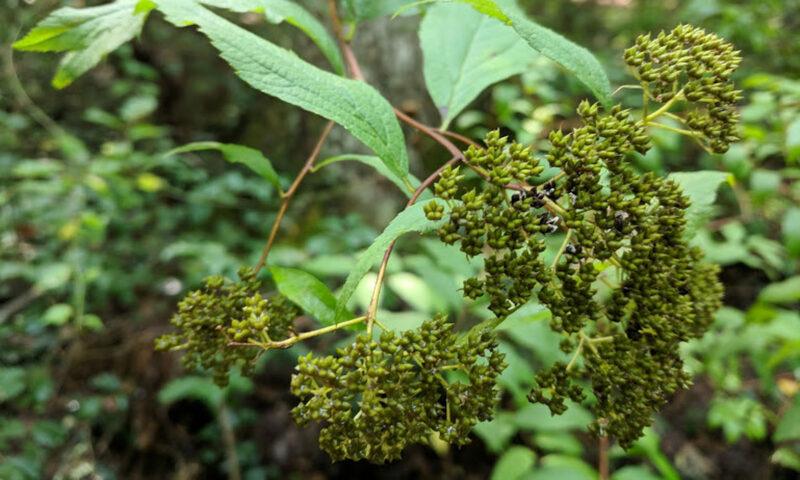 Trey and I have recently (without much conviction but off and on for about 3 or 4 months) been trying to eat more “natural”…less processed foods, more produce – you get the point. We’re trying to cut out artificial sweeteners, i.e. : we add honey to our respective morning beverages instead of Splenda. In fact, I put honey in just about everything (tea, oatmeal, Greek yogurt). It took some getting used to, but Trey swears that he feels better since the switch. I’ve also tried to make this switch to Mother Nature’s recipes in my beauty routine as well. For a little over a month now I’ve been using olive oil as my nightly skin moisturizer. Seriously. About 5 drops covers my entire face and leaves my skin smoother than any night crème I’ve ever used. The only reason I don’t use it during the day is due to the lack of SPF. Anyway, since it worked so well on my face, I started using it on my legs, arms, feet, hands – you name it! If it needs lotion, I reach for the olive oil first. Before you rush off to do this yourself, I should remind you that a little bit goes a looooooooooong way. I cannot stress this enough! So that was the first thing. I figure, if I have such a hard time going totally natural on the inside, at least I can do it on the outside! That’s when I stumbled upon this link (thanks Patricia! ): Never Shampoo Again! How to Wash Your Hair Using the No Poo Method. I had heard of washing your hair with baking soda before, but it always seemed impossibly messy. 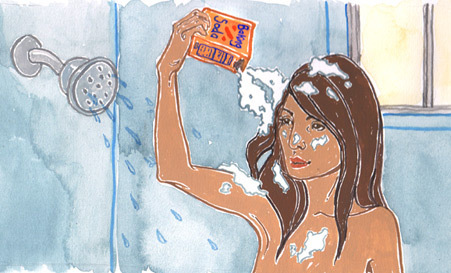 Seriously, how do you get a box of baking soda in the shower with you without accidentally making bread in your hair??? (I should note, I’m not a master baker and this is probably not the recipe for bread). This link basically breaks it down into step-by-step instructions that actually make this transition to using no shampoo doable! So I did it. Last Thursday was my official first day of not using shampoo to wash my hair. I’m still technically in the “transition” period, so I’ll try not to form an official opinion just yet, but those I know who use this method swear by it. There you have it: my bathroom cabinet is slowly being vacated by beauty products and turning into a pantry. And I kinda like it. Besides, if this works, it’s gonna save us boatloads each year in toiletry items! You know it’s been too long since you’ve done push-ups when you wake up the next morning before your alarm because your armpits are sore. I’m officially on Week 4 of my Couch to 5K running program. I’ve never been a runner. I’ve pretended to be, you know, that time the Triple Threat signed up for the Cooper River Bridge Run back in 2010…that was a dumb idea. But we finished it. And I ran more of it than I thought I could. But still, a runner I am not. My sincerest hope in doing this Couch to 5K program is that once I get up to running for half an hour straight (right now I’m up to 4 minutes before taking a walking break – and I’m crazy proud of that, by the way), then I’ll be hooked and just want to get out there and run any time I’m stressed or bored or craving copious amounts of chocolate. What’s frustrating is that I’ve been doing this for weeks now and I feel like I’m GAINING weight! No, I have not hopped on a scale. But still, clothes are feeling a little more snug that I’d like. That’s why I decided to add in the push-ups yesterday. We had a crazy wind-storm all day long…it blew the metal roofs off of several buildings on Main Street in Boerne, as well as Trey’s office. So I (quite wisely) decided that running outside wasn’t an option – even though Monday is definitely one of my scheduled run days. You may call it common sense, but the fact that I took the initiative to go out to the garage and do my run on the elliptical is kind of a huge feet for me. In the past, a little weather would have easily stopped me in my tracks, thus negating any progress I could have made. But yesterday I found a solution to the weather problem. And as I plugged away on the elliptical, I decided I’d also do a (small) circuit of push-ups, crunches, and squats: 3 rounds of 10 reps each. I know that’s not a lot, but I’ve been feeling seriously out of shape lately. I also have difficulty pushing myself. If I had a screaming trainer hovering over me (Jillian Michaels, anyone? ), demanding my all then I’d give it…it’s just that when I’m left to my own work-out devices, I don’t demand enough from myself. Anyway, after the circuit I finished off with some much-needed yoga. And it felt good. But this morning my armpits are killing me! I only did 30 push-ups! Thirty GIRL push-ups. 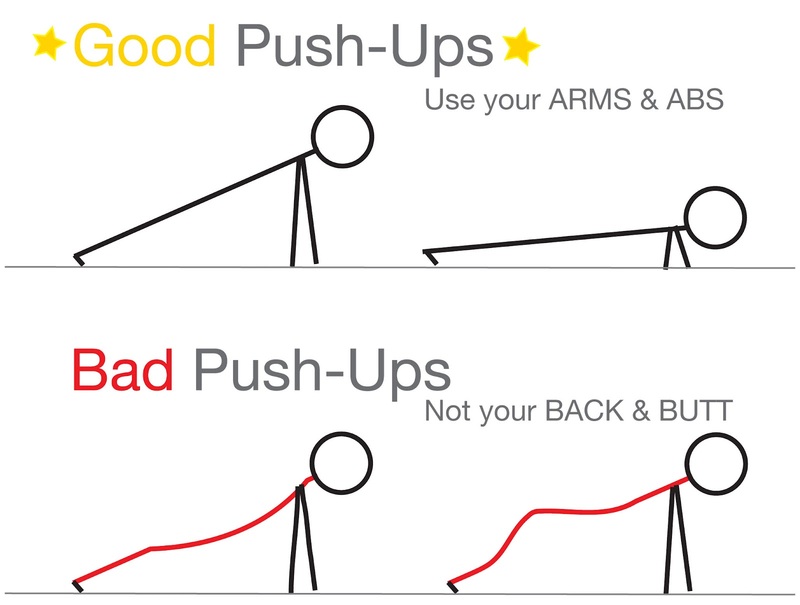 I hate doing girl push-ups (you know, with your knees on the ground instead of holding your entire body up in Plank). They make me feel weak and inferior. So now I’m stuck with this dilemma: do I take a day of rest to let my poor armpits recover, or do I push through? I mean, the folks on The Biggest Loser work out in 2-hour sessions multiple times a day! If they can do that, surely, so can I…right? I guess my point is that I’m taking baby steps toward fitness. And I genuinely just want to feel HEALTHY rather than skinny. But I need a kick in the bum. So, anyone who wants to come keep me motivated at least 3 days a week, come on down! Cause I need someone to push me! Did I mention my armpits hurt? This has the potential to be long and rambling. I usually get up in the morning and do my bible reading first thing. I brew some tea and have a slice of homemade bread with butter on it and snuggle up on the couch with a cat or two. I read my daily email devotion and I read the date’s corresponding Proverb (today’s the 8th so I’ll read Proverbs 8, get it?) and then I’m slowly but surely reading my way through the bible – I finished the New Testament first and have been reading the OT backwards a book at a time. Today I’m on Daniel. Anyway, because of other appointments around town and because I just couldn’t make myself get out of bed at 6am after doing yardwork all evening, I didn’t have time to do it this morning. So my whole day started a little off course. Today I completed Level 2 of Jillian Michaels’ 30 Day Shred for the first time. It’s my 11th day overall using the program. It’s been hard but good. I haven’t lost much weight but I can tell I’m getting toned, and losing inches (which is always nice). I’m sore, but not too sore. Just sore enough to be reminded that I have muscles that are being strengthened and not so sore that it hurts to run up the stairs. I’ve also been following the diet program from Power 90. Overall, I feel more confident and healthy. Not to mention a little proud of myself, even if today’s work-out totally kicked my booty. Trey’s out of town at a conference this week. I realized within 4 hours of his being gone that it is HARD to be a Proverbs 31 wife when your hubby is out of town. When he’s not coming home from work at 5 every day, what’s my incentive to have the dishes and the laundry done? Why not just have a movie marathon or curl up with a good book all day long? Because that’s not honoring my husband. It’s been a tricky few days but I think I’ve found an acceptable balance between enjoying “having the week off” and being a good productive wife. Watch a movie in the afternoon – mow the lawn in the evening. That’s a good compromise, right? For my birthday, my Secret Sister gave me a Groupon for a chiropractic visit plus an hour massage. It included x-rays and a follow-up consultation from the chiropractor after which I’d receive a voucher for a free hour long massage at a local spa. Sounded like a good deal to me. I’d never been to the chiropractor before so I thought it’d be interesting at the very least, but since I’ve never really had any problems with my back (other than slight aches due to arching my back all the time) I didn’t really expect much out of it. I went for the x-ray on Monday and had the follow-up today. And what I learned was that I’m broken. Broken enough that I could see the problem areas on the x-ray before the doc pointed them out. There is absolutely no curve to my neck…at all: so basically there’s no shock absorber for my giant head. And in my very last vertebra where there should be a thicker piece of cartiledge than all the other pieces, the cartiledge is deteriorated to almost half the size it should be. He recommends 12 weeks of treatment. My first thought was, “holy cow, sign me up.” But after discussing with his assistant what exactly would be covered by my insurance and what would have to come out of pocket, I realized that it’s just not gonna happen any time soon. So I asked the doc if there was anything I could do at home to, if not help the problem, at least not make it worse, and you know what he told me? He told me to avoid reaching over my head. WHAT? I’m 4’11”! My entire life is spent reaching over my head! And even though I think it’s silly, I’m really bummed out by all this. Hillary (my awesome laser technician – I’ll get to that in a minute) said it’s like going to the dentist for a routine cleaning and finding out you needed a root canal. After leaving the chiropractor I drove to MEDermis Laser Clinic for my 8th laser tattoo removal treatment. It’s funny, I both really enjoy going and really dread it at the same time. Quite frankly, having a tattoo removed via laser hurts like the dickens. But every time I go I know I’m one step closer to getting rid of a stupid mistake I made more than 10 years ago AND I really like my laser technician. Hillary is super friendly and we get along great – no awkwardness like when you go to a new hair dresser and just don’t know what to say to fill the time while you’re stuck in very close quarters. What’s funny is that I truly believe that other than our once-every-six-weeks meetings, I’m quite certain that Hillary and I would never be friends. And I can’t quite put my finger on why. But I really enjoy her company while she’s burning the ink from my flesh. So, in short, today I’m lonely (cause Trey’s out of town), broken, and in crazy pain (from the laser treatment). I’m all out of whack and I don’t know what to do. Do I stop my work-out routine to save my back – even though the damage has already been done and it’s been years in the making? Do I try to scrounge up every penny I can so I can start chiropractic treatments asap? Do I clean the house from top to bottom to welcome my awesome hubby home? Or do I slump down on the couch, prop up my feet, write a blog whining about it, and eat 3/4 of a pint of Rock Road for lunch? I don’t like to cook. I hate following a recipe. But on nights like tonight, when Trey’s working late and I’m on my own for dinner, I turn into a culinary genius. Shh, don’t tell him! 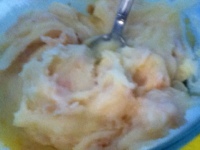 It’s no secret that my favorite food in all the world is mashed potatoes. Flakes, real, plain, loaded, I love ‘me all. So when it’s just dinner for one at Chez Hendon, you can guess what’s on the menu. The only trouble is deciding what flavor I’m in the mood for: sour cream, BBQ, feta, garlic…the possibilities are mouthwatering (you thought I was gonna say “endless,” didn’t you?). Well, tonight, it’s turkey and cheese. I’ve been in the upstairs office all day today editing old short stories that I wrote in college (wow, I used a lot of adjectives back then). Any time I get in that writing “zone” I always eat junk food. Not because I crave it or because it’s comforting, but because it’s easy and I can eat it one-handed. So, with that in mind, I’m sure you can deduce that my lunch was all but super-nutritious. In fact, it was graham crackers and peanut butter and lemonade. you know what this needs? Peanut butter. So off I went, down the stairs into the pantry to grab the pb and a knife to spread it with. And then up the stairs I ran. I’m running up the stairs with a knife in my hand. I’m glad Jesus loves me because otherwise this could really end badly. I’m sure you’re all interested to know, both I and my peanut butter survived the ascent. His response: “I didn’t know they made it scented.” Or something to that effect. And he was genuinely surprised…his manly shaving cream smells just like that: man. Why is it that all his toiletry items smell like Man and all my toiletry items smell like a flower shop and a fruit cart had a fight? When I was in the women’s choir in college, our professor had one rule (other than basic music theory): Don’t smell good, don’t smell bad, just don’t smell. And I agree. I can’t walk within 10 feet of a Yankee Candle or Bath & Body Works without gagging. All that smell is overwhlming. It makes my eyes water, my throat sting, and my nostrils flare up in protest. Why is it that the body industry thinks women want to smell SO MUCH??? Can’t we just smell a little bit? We all have bouts of mental illness now and again. My favorite happens to be Obsessive Compulsive Disorder mixed with a little run-of-the-mill neurosis. Whether it’s alphabetizing every DVD we own or rearranging the medicine cabinet for the 3rd time this month, I like to have everything in it’s place, like items placed together. When it’s impractical to alphabetize, I place things in size order. That’s where my french fry conundrum comes in. When it comes to fries, I prefer mushy ones because they retain most of the natural potato flavor. Steak fries are my favorite, crinkle fries are a close second. The fatter the fry, the better. So you can imagine that fast food french fries are not my first choice. They’re skinny, they’re hard, and they’re almost always over-salted. If I wanted a hot potato chip, that’s what I’d be having, but when I want french fries, I want them to have some quality of the best food in all the land (mashed potatoes) somewhere in there. When my hubby and I split fries at the number one fast food joint in the U.S. (um, Golden Arches…), he takes the over-cooked, pointy-ended, slightly browned ones, and I take the floppy, mushy, golden ones. However, I must admit, my french fried freakishness goes a step further: When fries are that thin, I prefer to eat two or three at a time. The catch is, they all have to be the same length. Seriously, why do these things matter to me? What is it about women that makes us want to pretend to be dainty health nuts every time we assemble en masse? Earlier this week I volunteered to help set up for the spring Women’s Luncheon at church (in case you’re curious, a Women’s Luncheon is the same exact thing as a Ladies’ Luncheon – except for some reason, people think it sounds younger…it doesn’t). After tying hundreds of cute little bows around bags of the daintiest cookies (Lacey’s, yes, even the name of the cookie is dainty). I’ve ever seen, I discovered that that was dessert. Not just a sercy, but honest to goodness dessert. Then I discovered that the entire meal for this luncheon was a salad and the cookies. That’s not a meal! That’s an appetizer! But it was no shock to me. Every women’s luncheon I’ve EVER attended served similar fare. What is that about? Why is it when women get together they spazz out and turn to The Girly Side. They suddenly become more concerned with center pieces and the way things are plated than people actually receiving adequate sustenance. The Girly Side is the same state of mind that caused someone to invent doilies. And mussy-tussies. And coursages. With all due respect, I say YUCK! One of these days, I’m going to host a Ladies Luncheon where the table toppers are those peg games you find at Cracker Barrel and pictures of people making ridiculous faces. And no one will have to run through a drive through to kill the hunger pangs after my Ladies Luncheon…because at my luncheon, we’re having steak and potatoes. I’m constantly meeting new people. That’s what happens when you move to a new city. You meet new people. Trey and I have several friends “our own age” that we spend time with here. Except “our own age” means 23. What? Either I’m a horrible age guesser or I have no idea how old I actually am. I’ve always looked younger than I am. When I was 21 I was still getting carded to go to rated R movies without an adult. Now that I’m 30, I still get carded for beer…but only when I’m not wearing makeup. Don’t get me wrong, I love looking like a kid. I know I’ll love it even more when I’m 60. Part of it is because I have (in the words of my super-young-looking Mom) young genes. Part of it is because I started a pretty involved skin care regimen when I was 9. Why? Because for a brief shining moment in time, I was a child model. Are you done laughing yet? Let me explain. When dance lessons and piano lessons and gymnastic lessons got old, I asked mom if I could take modeling lessons. As a step toward acting I guess. I learned how to walk a runway. I learned how to deliver lines in front of a camera. And I learned how to take really good care of my skin. This is probably the reason I started using anti-wrinkle cream at the ripe old age of 23. Which is how old my new friends are.